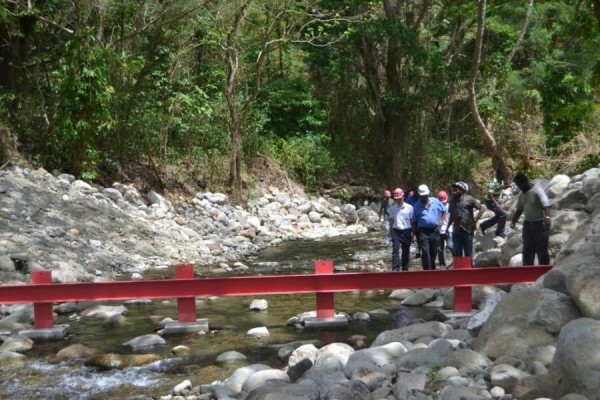 Last Wednesday’s site visit was the last tour of the completed St Mark Flood Mitigation Project, before government signs off and issues the certificate of completion to China Harbour Engineering, the executing company. 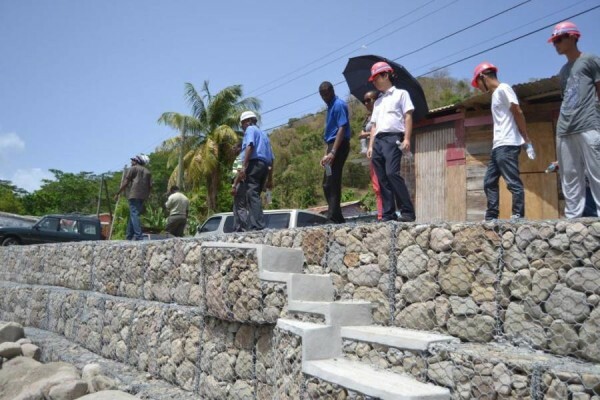 A team of engineers and other personnel led by the Chief Technical Officer (CTO) of Works, Winston Gabriel, toured the entire 900 metres of the project. The CTO identified a few areas requiring some minor adjustments specifically related to drainage of waste water from residences into the river, but he expressed overall great satisfaction with the work done by China Harbour. The CTO is expected to put in writing his findings, and make final recommendations for any adjustments to be made. A restraint in place to hold back fallen trees, etc during heavy rains. Janis Lessey-Cuffie, PR Manager for China Harbour noted that there may just be an opportunity for the people of St Mark to capitalise on, in the area of tourism, as the river has been expanded and graded, and the banks now present a comfortable walkway for persons to easily access parts of the river previously difficult to access. Swimming basins have been dug out for the residences to enjoy. Steps to access the river have been laid down and even stones have been placed strategically for persons to continue to wash, and do the things they are used to doing in the river. “The river is now so attractive and accessible, that I can foresee it becoming an attraction, not only for St Mark’s residents but for people throughout Grenada and beyond,” said Lessey-Cuffie.